Venerable old Harper’s, which has long harrumphed about apps and the internet, has finally come around with today’s launch of an iPhone and iPad(s aapl) edition that sells for $21.99 a year. An Android edition is coming soon. Harper’s decision to sit out the digital era has harmed its reach and relevance, especially in relation to longtime competitor The Atlantic, which has been nimble in the post-print era. 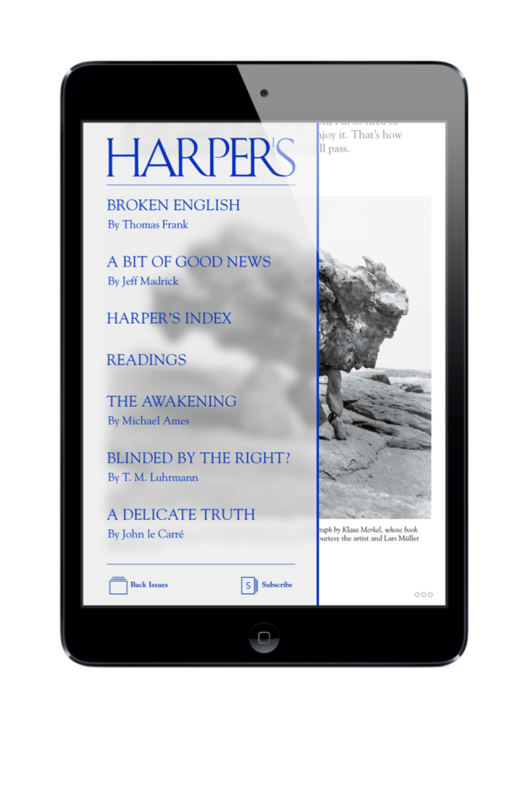 The good news for Harpers is that it’s better late than never, and that it picked a good partner, 29th Street Publishing, to navigate the app world. 29th Street, barely a year old, is now up to 20 magazines, and has 60 more in the pipeline. Its publishing partners typically pay an upfront development fee plus small incremental amounts for 29th Street to deliver new editions on a weekly or monthly basis to subscribers mobile devices. Jacobs said he continues to wrestle with determining which conceptual and aesthetic elements of conventional magazines belong on app platforms, and which must be developed organically for an app audience. As his stable of templates grows, he believes that another notion from the print publishing world — the imprint — can serve as a useful concept in the digital age; he hopes that the literary world will come to see 29th Street as an imprint, or a short-hand for a breed of quality publishing.